A probationer was Tasered yesterday afternoon in Elk Grove after he allegedly resisted being detained by police officers. The suspect, Jousha Matthew Head, 31, of Sacramento was operating a vehicle that was stopped by Elk Grove Police near Elk Grove Boulevard and Wymark Drive for a code violation. A records check revealed Head was on probation, and when officers attempted to detain him, he reportedly resisted. 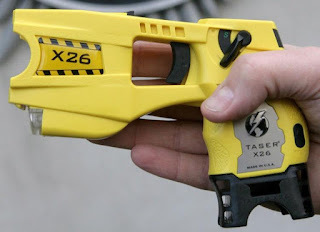 Due to the resistance, officers deployed the Taser and Head was taken into custody. The suspect is being held at the county jail on $560,000 bail for child endangerment and resisting arrest and will be arraigned on Wednesday, April 19. The child in the vehicle was taken into protective custody.